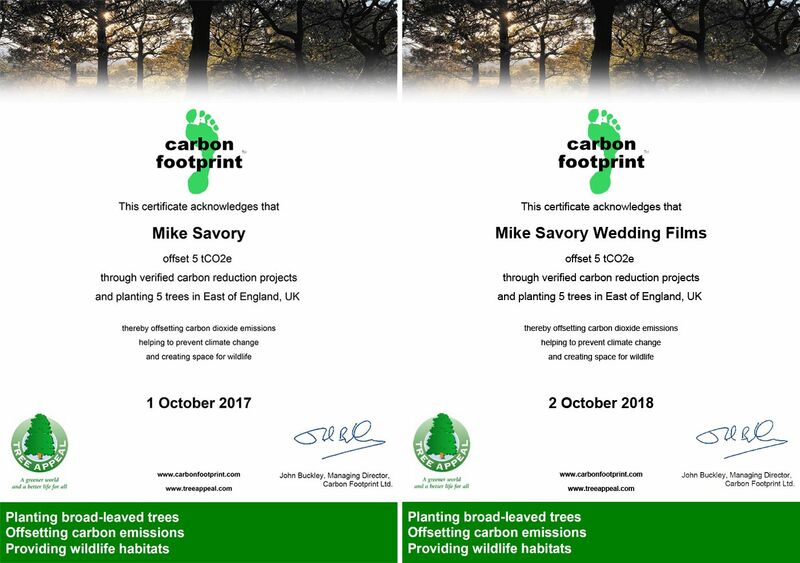 I am passionate about videography and care about filming things in the most natural environments possible, this being so being as eco-friendly as possible is a significant part of Mike Savory Wedding Films. A few years ago I had a little look at my business’ impact on the environment, it soon became obvious that I wasn’t doing as much as I could . The first thing I looked at was the amount of energy being used in my home and the impact this has. In 2017 under 30% of electricity produced in the UK was from renewable sources. After a bit of research, I came across Bulb, an energy company who not only provide 100% of their electricity from renewable sources but are also one of the cheapest suppliers on the market. Next it was have a look at my paperwork and contracts. Studio Ninja is my online delivery system for all my paperwork. It is all stored securely and means that there is no printing or paper in my office on a day to day basis. Promotional material can mean using a lot of natural resources but I always look for printers who use recycled materials and green methods to produce their products. All of my wedding films are stored online and delivered in that way, the packages that include USBs I ensure that my USB boxes are produced using renewables wherever possible and the way my products are then packaged are plastic free using natural products wherever I can. The USB boxes are produced in the UK to limit the effect of air freight. Despite this though I am aware that I still will cause an impact on the environment. I take part in offsetting carbon scheme where I calculate all my mileage, time spent on my computer, heating, battery charging etc. and sponsor tree planting in local schools. Not only does this help children learn but also helps to learn about the environment but also helps to keep the impact I have on the environment to a minimum.